Hockey in Minnesota is a way of life, and for K’Andre Miller’s it has been no different. 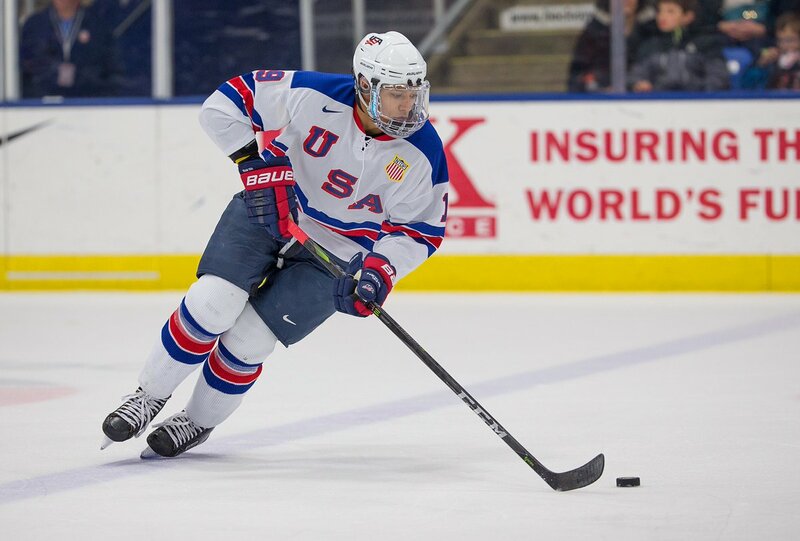 When he got the invitation to play at the National Team Development Program (NTDP) in Plymouth, Miller said he believes he made the right decision. Miller, originally a forward, has made the transfer over to playing on the blue line, and he admits there were some growing pains, but that he’s learning along the way. A Wisconsin Badgers commit, Miller said the decision for him to play for Head Coach Tony Granato was an easy one. While there can be significant distractions from the process of moving toward the next level, Miller is focused on succeeding in the present. Currently projected as borderline first round pick by multiple publications, Miller said he hadn’t believed that would even be in the realm of possibility when he first got to the Team USA program. Wisconsin has a history of placing very good two-way players into the NHL, and Miller is hoping to be in the next wave of talent that the Badgers program sends to the league. Miller is fully aware that there is more to being a hockey professional than the game on the ice. He himself benefit significantly from have a role model in a particular Minnesota Wild forward. Miller currently has 18 points (6G- 12A) through 38 games, with a +7 rating.